Directed and co-edited by Michelangelo Antonioni and screenplay by Antonioni, Franco Rossetti (as Fred Gardner), Tonino Guerra, Clare Peploe, and Sam Shepard from a story by Antonioni, Zabriskie Point is the story of a college dropout whose presence at a student protest has him go on the run to the Zabriskie Point desert where he meets a young woman on the way. Set against the American counterculture of the 1960s, the film is an exploration of identity and ideals as a young man and woman deal with their surroundings during a tumultuous period toward the end of the 1960s. Starring Mark Frechette, Daria Halprin, and Rod Taylor. Zabriskie Point is a ravishing yet eerie film from Michelangelo Antonioni. The film is a stylish and poetic telling about two different people who both go on different journeys where they meet on their way to their respective destinations as they visit Zabriskie Point near Death Valley. It’s a film that doesn’t really have much of a plot yet it is more about two people who are part of two different environments as they become overwhelmed by those surroundings. The film’s screenplay is very loose as it play into not just the world of the American counterculture as it becomes more desperate to fight back and go into revolutionary tactics but also the corporate world as it becomes more prominent in its rise while the counterculture is in the decline. The two protagonists in a college dropout named Mark (Mark Frechette) and an anthropology student named Daria (Daria Halprin) are both people part of different kind of scenes but it’s the former that has become dissatisfied. The opening scene is set in a meeting where Mark realizes all of this talking about what to do has made him bored as he tries to make sense of what is going on. Especially when people he know are going to jail in protests and such while he is aware of what is emerging outside of the counterculture. When he finds himself in part of a scuffle with police as it goes all wrong, he escapes by stealing a small plane and fly around California. The character of Daria is more complex as she’s just a student who works part-time as a secretary for a corporate businessman (Rod Taylor) who is planning to create housing in some remote land in the American Southwest. Daria would drive to Phoenix as she would encounter strange things in her journey until she is met by Mark on his plane as the two would meet as the film then takes a different turn once they venture into the mysterious valley known as Zabriskie Point. Michelangelo Antonioni’s direction is definitely mesmerizing not just visually but also in the way he aims for something that is unconventional in its American setting. Shot largely on location in Los Angeles and around Carefree, Arizona with scenes shot on location in Zabriskie Point, the film play into not just this sense of chaos that is looming into the counterculture where non-violent protests have given way to violence on both sides. Antonioni’s direction for these meetings and protests are presented in a somewhat documentary-like fashion as it display Mark’s own sense of alienation as he is aware of desperate the counterculture has become but also know what is emerging. Antonioni’s visual approach to display this emergence of capitalism and materialism through ads including a commercial about a real estate venture in the desert is very eerie as it relates to what would happen in American culture. Antonioni would often have ads in the background whereas a character such as Mark would be in the foreground. For Mark, it is overwhelming as his attempt to take part in a protest after being arrested for trying to bail out a friend gets him into trouble where he would steal a plane and fly around the American Southwest. Antonioni’s usage of wide shots allow him to take a great depth of field to showcase the Zabriskie Point valley at its most vast as it is centerpiece of the film’s second half. Especially as it play into elements of fantasy of what Mark and Daria want in their idea of free love where it’s all about not worrying about the realities of the world. It is a sequence that is quite surreal but also contain some gorgeous imagery where Antonioni’s usage of close-ups, medium shots, and wide shots add so much to something that feels lose and free. Antonioni would include also include moments that are strange as it relates to the reality of America that Daria from her encounter with children at a town to eventually arriving at her destination. The latter which serves as its climax is set in this very quaint and posh environment that is beautiful but it’s also very suffocating. It would lead to an ending that is about that disdain of the growing sense of materialism and capitalism that would dominate the ideas of America. Overall, Antonioni creates an intoxicating yet startling portrait of alienation and the emergence of a more controlled and consumerist society in the waning days of the counterculture. Cinematographer Alfio Contini does brilliant work with the film‘s very vibrant and colorful cinematography to capture some of the locations in and around Los Angeles to the look of the desert with its naturalistic and beautiful imagery as it is a major highlight of the film. Editors Michelangelo Antonioni and Franco Arcalli do excellent work with the editing with its usage of jump-cuts and some stylish montages for the free-love sequence while aiming for moments that go on for a few minutes without the need to cut immediately. Production designer Dean Tavoularis and set decorator George R. Nelson do amazing work with the look of the posh resort home at the film‘s climax as well as the design of the offices and the diner that Darla goes to. Costume designer Ray Summers does nice work with the costumes as it mostly casual with bits of stylish clothing that play into the world of the counterculture and Corporate America. Sound recording supervisor Franklin Milton does superb work with the sound as it play into the way the plane sounds in the air as well as the chaos in the protests and in city life to the more quiet world of Zabriskie Point. The film’s music soundtrack is incredible as it feature some original score music from Pink Floyd with its usage of progressive and post-psychedelic rock to the Americana-based rock of the Grateful Dead with a piece by Jerry Garcia. The rest of the soundtrack includes pieces from John Fahey, Kaleidoscope, the Youngbloods, the Rolling Stones, Patti Page, and Roscoe Holcomb that is a mixture of rock and country while the American release version of the film features a song by Roy Orbison that is an odd placement for the film‘s final credits as it was something MGM put in against Antonioni‘s wishes though the song is great but doesn‘t fit in with the context of the film. The casting by Sally Dennison is fantastic as it features appearances from Harrison Ford as a student in jail, Philip Baker Hall as a deli owner, Bill Hickman as a gun store owner, Bill Garaway as Mark’s friend Morty, Paul Fix as a diner owner, Kathleen Cleaver as a secretary, G.D. Spradlin as an executive, Sam Shepard as one of the people in the free-love sequence, and Rod Taylor as Daria’s boss/possible lover Lee Allen who is trying to put some housing in the desert as he thinks it is the future of American living. Finally, there’s the duo of Daria Halprin and Mark Frechette in their respective roles as Daria and Mark as two individuals lost in their world as both of them are excellent as they’re not given much to do but be natural and react to the chaos their surroundings. Zabriskie Point is a phenomenal film from Michelangelo Antonioni. Featuring dazzling visuals, a sprawling soundtrack, and eerie themes on alienation and changing times. It’s a film that is definitely confrontational in some respects but also tell a lot of truth about what would emerge in the aftermath of the counterculture and the fallacies of revolutions that was so prevalent in the 1960s. 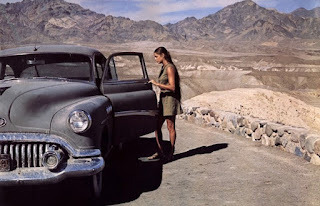 In the end, Zabriskie Point is a tremendous film from Michelangelo Antonioni.